“Cycle streets” closed to other traffic, new routes by parks and sixty miles of backstreet “Quietways” are part of the proposed Grid. Many of the new Quietway routes will run parallel to Tube lines or bus routes so that cyclists will know where they go. 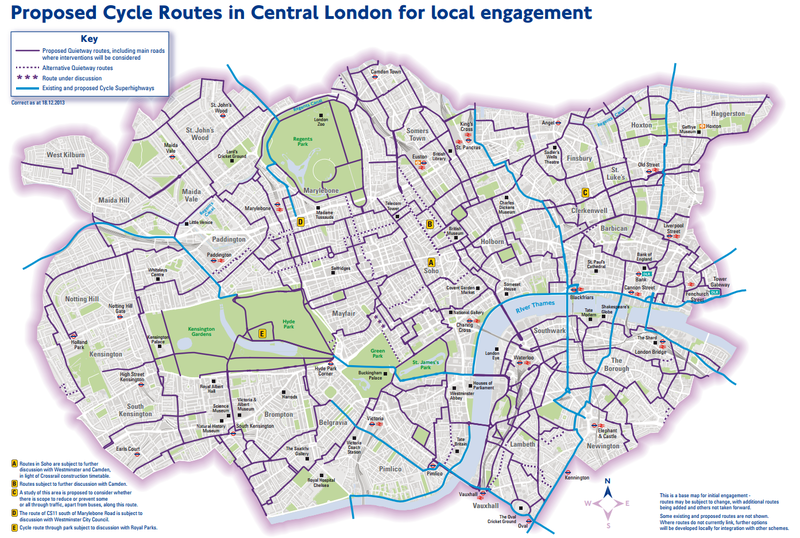 A “Circle Line Quietway” and a “Victoria Line Quietway” are among the routes published today. A number of Superhighway and other main-road routes will also form part of the Grid, most fully or semi-separated from traffic (with solid kerbs or traffic wands) where they run on busy roads. Some one-way streets will be made two-way for cyclists. Intimidating and difficult junctions will be improved. 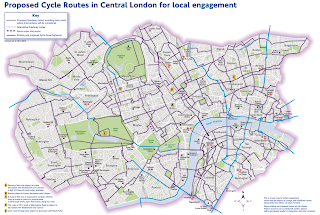 A study will be launched into traffic restrictions on one very busy main road corridor where there is no room for segregation and no Quietway alternative."